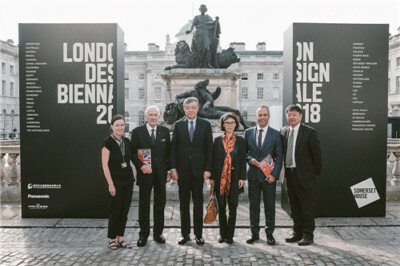 At the invitation of Sir John Sorrell, President of London Design Biennale, Ambassador Liu Xiaoming and Madame Hu Pinghua visited London Design Biennale 2018 at Somerset House on September 17. Sir John Sorrell and Ben Evans, Executive Director of London Design Biennale, briefed Ambassador Liu on the London Design Biennale and extended congratulations on the Honourable Mention of the Memory Project of Nanjing Yangtze River Bridge. 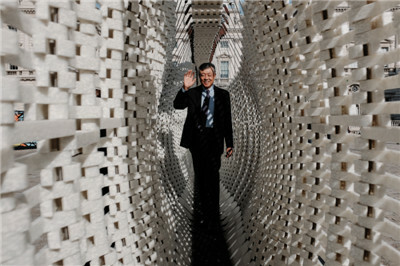 Sir John said that China has been actively involved since the first London Design Biennale in 2016. This year’s Biennale is highlighted by Chinese elements, with exhibits from Nanjing, Hong Kong Special Administrative Region and Taiwan on display side by side, and Poly Culture Group Corporation Limited being the chief sponsor. He thanked Ambassador Liu and the Chinese Embassy for their huge assistance in promoting London Design Biennale and believed that the Biennale will contribute more to the understanding of China in the UK. 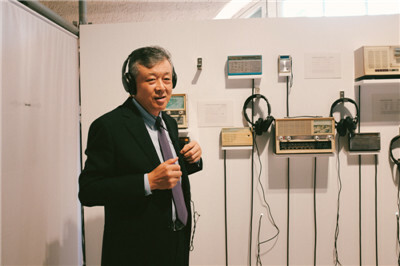 Ambassador Liu said that the success of the first London Design Biennale in 2016 is a new hashtag for London. He expressed his best wishes that the Biennale will be more and more popular. 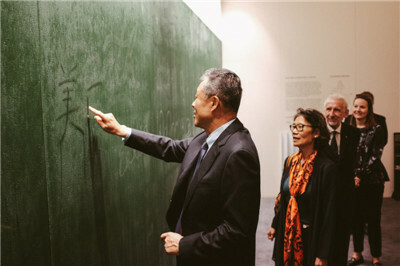 He hoped that more and more Chinese cities and enterprises will actively participate in the Biennale to show the unique charm of Chinese creativity and Chinese design to the British visitors, and contribute to the mutual understanding and friendship between the two peoples. 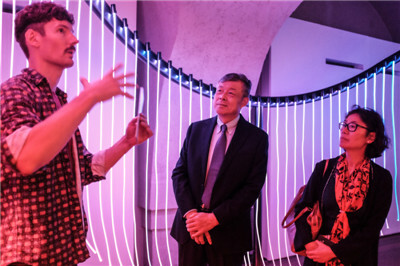 Guided by Sir John and Mr. Evans, Ambassador Liu and Madam Hu listened to the design team of Nanjing Pavilion about the Memory Project of Nanjing Yangtze River Bridge and visited exhibits from Greece, Poland, Mongolia, Latvia, Egypt, and other countries. London Design Biennale, founded in 2016, is hailed as the “Venice Biennale of Design”. The first Biennale attracted designers from 37 countries, cities and territories around the world. The Second Biennale, opened on September 4 this year, presents projects from 43 countries, cities and territories including Nanjing, Hong Kong Special Administrative Region and Taiwan. Themed “Emotional States”, the Biennale explores the connection between design and emotion to show how design affects human emotions, memories and states of existence. Attaching great importance to this Biennale, Prime Minister Theresa May held a reception for the Biennale at 10 Downing Street, and Ambassador Liu was invited to the event. The Memory Project of Nanjing Yangtze River Bridge was initiated by Professor Lu Andong of Nanjing University. Built in 1968, Nanjing Yangtze River Bridge was China’s first extra-large bridge designed independently and constructed basically with domestic materials. It is not only a milestone in the history of China’s bridge construction, but also the showcase of the spirit of “self-reliance and courage”, carrying the collective memory of several generations of Chinese people. In 2014, Lu Andong, together with a number of historians and local artists, initiated the Memory Project of Nanjing Yangtze River Bridge after collecting and studying a great deal of relevant objects and audio-visual materials. The installation consists of three parts, namely “reverberation of sounds”, “stacking of images” and “commemorativeness of the times”. It uses various media, such as images, videos, audios, objects and models to display the Nanjing Yangtze River Bridge, a historical and cultural symbol, to viewers. The entry was highly praised by the jury, saying that its academic quality “deserves to be on display in Museums”. The project won Honourable Mention, a special new award at London Design Biennale 2018.